In the late 19th century The Rink was established as a theatre, ballroom and a skating rink. The Rink has seen flower shows, boxing matches and dog shows at a time when Mussoorie was a fashionable summer resort for the ruling elite. The memsahebs and sahebs met to have tea, watch a Shakespearean play, dance in the evening to lilting music. …And when their hearts were lonely they took a ride back home on moonlit nights on Camel’s Back Road. Legend has it that Queen Mary visited The Rink. Ever since, efforts were made to preserve the memories of the Colonial Raj. The balconies of the magnificent wooden hall are unrivalled and stand testimony to the fact. Today The Rink Pavilion is a boutique hotel. Come visit The Rink Pavilion and rediscover the colonial era. The Rink Pavilion is a hotel with modern facilities for large conferences, business meetings, theatre performances, fashion shows and literary workshops. It makes an excellent family get away. Twenty two elegant and contemporary rooms greet you overlooking flower filled valleys. A cafeteria abounds serving you favorite recipe. …And when you have had enough just gaze through the windows and dream about the pristine calm unsullied nature. Roller skate on of the largest wooden floors in India under the guidance of experts. And don’t be surprised to discover that your grandparents also skated here to their favorite tune. The billiard saloon is magnificent. Pay you days away… and relax. 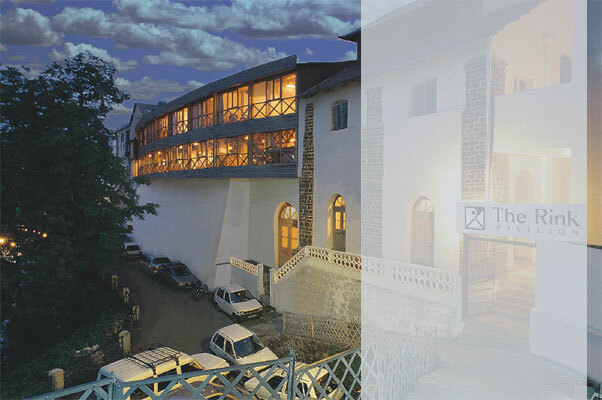 And just as you wear out, walk down and discover Mussoorie. Drive upto Hathipaon and see the house where George Everest calculated the height of Mt. Everest. Visit Sisters Bazaar and climb up along the water fall at Kempty Falls. Take a tour to Happy Valley the erstwhile abode of the Dalai Lama or ride a pony on Camel’s Back Road.